This past weekend was a weekend filled with indulgences. First, and foremost comes this cake - this decadent cake with its three separate layers of goodness: a delicious brownie-like chocolate cake whose centre is scooped out and filled with tangy homemade lemon curd that is then topped with meringue icing. Can you think of a more decadent dessert? This recipe was one of my favourite finds from the 10th anniversary edition of Donna Hay's magazine . I love the idea of using chocolate cake as a shell and while I did find the cake a little too sweet (I would have added much less sugar overall) the cake was a delight to make, and beautifully indulgent to look at. You can find the full recipe here - try it and let me know what you think! I will definitely be using this idea as a base for future baking experiments - I'm thinking of filling chocolate cake with raspberry coulis instead of lemon curd next time, and topping it with billowy vanilla bean whipped cream. Or how about filling the cake with bittersweet chocolate ganache and topping it with a scoop of homemade ice cream? Here is a shot of the cake once the centre has been scooped out - and filled with the luscious lemon curd. I made a smaller cake than what the Donna Hay recipe calls for (there's really no need to make the full amount if you're not having family and friends over for dinner - a slice is more than enough with this treat!). I made mine in a mini-cast iron and used a round cookie cutter to make it easier to scoop out. No matter how much I cook and how long I've been professionally developing recipes, I'm always looking for added inspiration. 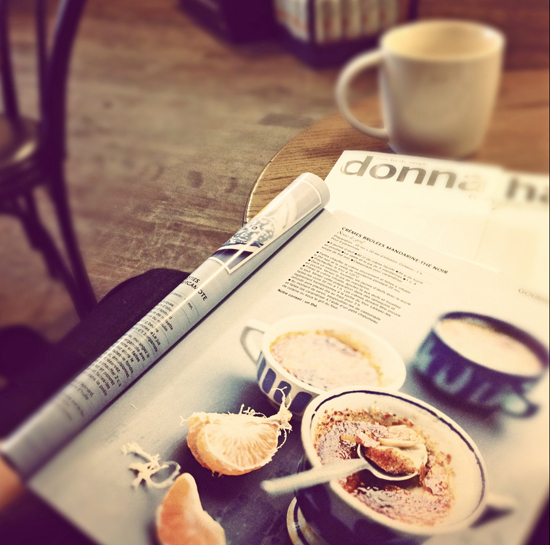 Food magazines and cookbooks are the perfect place to start. Sometimes, I'll follow a recipe from A to Z and jot down some notes and ideas - other times, just flipping through a few of my favourite magazines is enough to get me started. My over-stacked shelves are not always thankful for my food literature obsession but it's really the best way I've found to constantly stay inspired. Such a tempting dessert, love the second pic! MMMMMM this looks good will try it this weekend. This is so gorgeous, I can't really imagine the taste but I am intrigued. I agree that raspberry coulis would be fantastic in place of the lemon. I bet a nice strawberry or cherry compote would be absolutely killer in this too. Definetely on my "must make" list! oh my god I've died and gone to heaven!!! This looks awesome. I'm so happy to see this combination. I love chocolate and lemon together. OMG ...una delicia irresistible me encantamuy tentador,abrazos hugs,hugs. This is one gorgeous and tempting dessert! Love the flavors of chocolate and lemon together. This just made me smile. And want to eat like 4 slices of it. What a fun, creative idea. Love it! Patrice: I'm glad it made you smile - it's a deliciously indulgent cake! 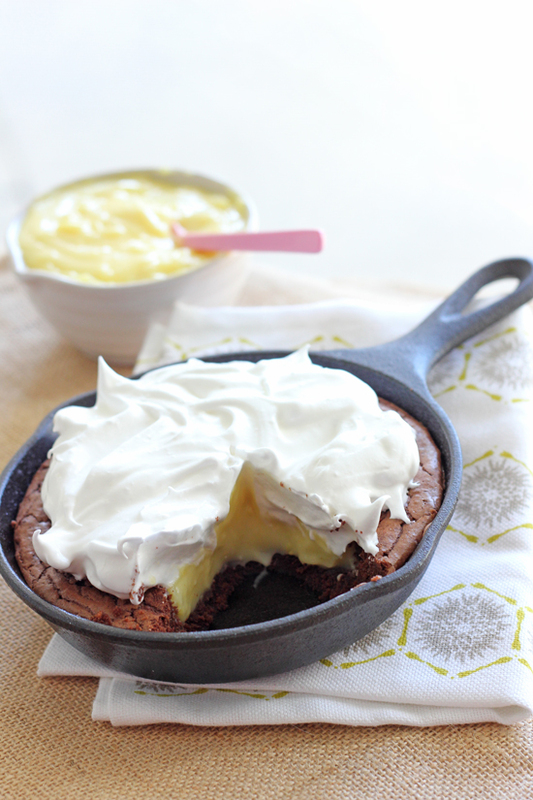 I absolutely love the Lemon Meringue Chocolate Cake idea! The photos of it are mouthwatering! Thanks for sharing that- it will definitely be the next dessert I try! Especially since i have a small cast iron pan! Anonymous: Let me know how it goes! If you don't have an incredible sweet tooth, I would try it with a little less sugar (especially in the lemon curd!). 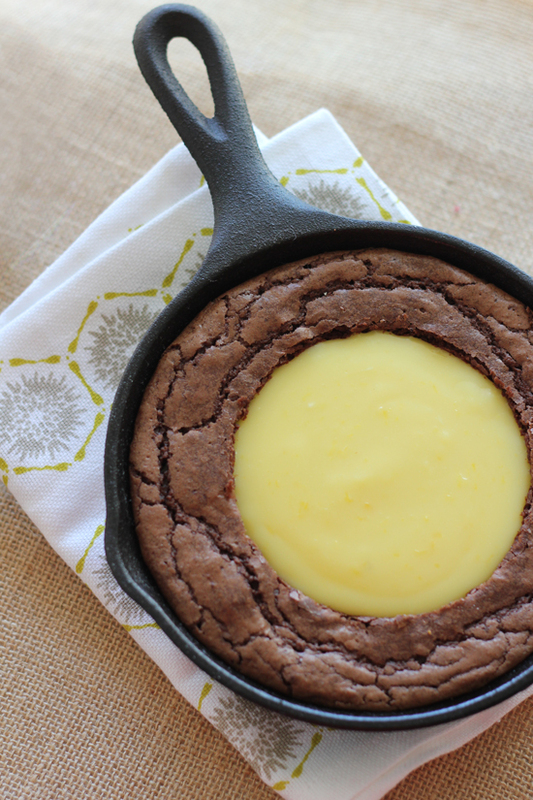 The dessert looks like a sunnyside up egg! Was there a quick and easy way to get the centre out with out destroying the rest of the brownie? It looks like a terrific individual dessert to serve guests at a brunch or something. sarah: The easiest way is to use a round cookie cutter that has just the right size and insert it into the centre of the cake to create the desired shape. Make sure to not insert it too deeply as you want the base of the cake to stay solid and untouched. Remove the cookie cutter and carefully scoop out pieces of cake using a small spoon and keeping within the defined border. You can then pat down the remaining cake using the back of the spoon so it's a smooth surface. Lemon and chocolate are not paired much, but this cake is fantastic! The stacks of cookbooks and magazines are necessary, even if you don´t work in the food industry! This looks really great especially the lemon center! I love to try this one out and make it for my family. This looks delicious and I can't wait to try it. Is it easy to slice or is it fairly soft in the center? I want to make it as a birthday cake but I am worried it will turn into a puddle when we take a slice!